In previous posts, you’ve already learned how to compress or reduce the size of high-resolution images without losing their quality. This time, you’re about to learn how to batch compress JPG and PNG images so that you can save more space and enjoy the benefit of being able to upload or store more photos to your website or cloud storage account. Open your preferred web browser. You can use Chrome, Firefox, Safari, Opera, etc. The choice is yours. Click this link  to go to the homepage of “Prizm Image” – a free web application that lets you reduce the size of your PNG or JPG images. Now, the first thing that you need to do is to register and create an account. After doing so, log in to the web app. Once you’re logged in, find and click the “My Images” option on the top-right portion of your Prizm Image dashboard. You will then be taken to the web app’s image compressor tool that supports drag-and-drop and bulk uploads. Upload your images. You may opt to upload your images from Dropbox or upload it directly from your computer. You can also set your image compression preference to smaller size, better quality or balanced. Wait while the web app uploads your images. After upload, the web app will immediately display the results for each compressed image. You can also do a before and after image size comparison. 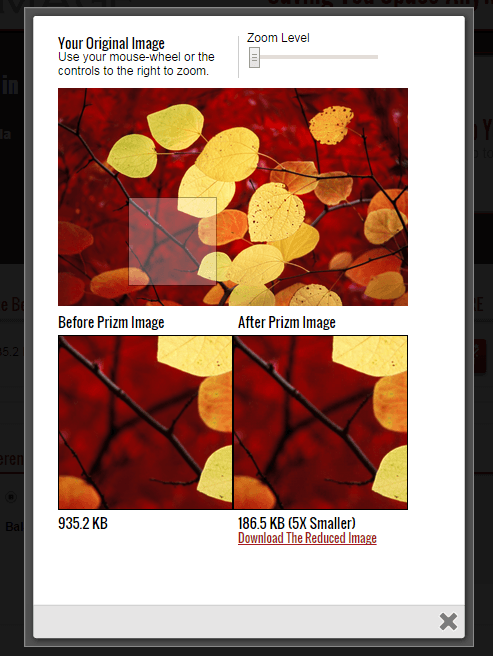 Anyways, with Prizm Image, you can reduce the size of a 935.2 KB file to 186.5 KB (which is roughly five times smaller). The good thing about this is that the quality of the image won’t be affected. So it’s great for optimizing images for online sharing and uploads. So that’s it. Don’t forget to download and save your compressed images to your computer.